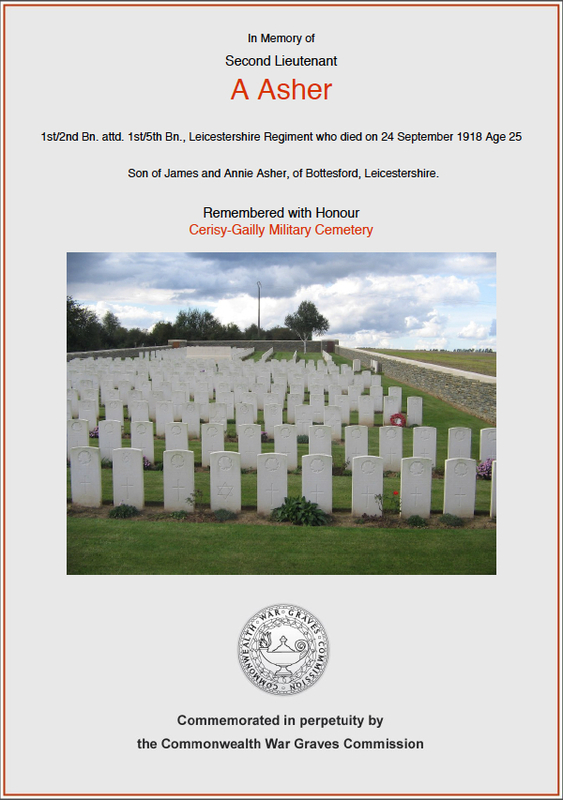 Albert Asher, born in Bottesford in 1893, was the third son of James and Annie Asher. His elder brothers George William and Charles Frederick were born in 1884 and 1888 respectively and his younger brother in 1896. In 1891 James and Annie, with their eldest son George, lived on Belvoir Road, Bottesford. James Asher worked as a railway platelayer. By 1901 the family had moved to Butcher Row on the High Street. James Asher still worked as a platelayer. George was now a bricklayer’s apprentice, Frederick was an agricultural dayboy and Albert and Harold were at school. Albert was awarded a County Junior Scholarship in 1904. (The Honours Board in the Fuller Room at the Old School, Bottesford, records his academic success). In April 1911 the family were still living on the High Street in Bottesford. Harold was now also working for the Great Northern Railway as a telegraph boy. Albert’s occupation was entered in the census as ‘School’. On 28 August 1911 Albert Asher began duties as a student teacher at Bottesford School until the summer of 1912. On 12 September 1912 he obtained a 1st Class in Religious Knowledge in the Diocese of Peterborough. His year’s training as a student teacher was under the supervision of Victor Collett the Head teacher at Bottesford School. The logbook of his training, which is still in the possession of the family, describes in meticulous detail his development as an exemplary teacher. He left Bottesford School on qualification to work as a Private Tutor. Albert was a member of the Church Choir, a founder member of the Scouting movement in Bottesford and played football with Bottesford FC. Albert Asher first served as a Private with the Army Service Corp as a ‘warehouseman’. He saw home service between the 12th October 1914 to the 26th December 1915. He then served with the Expeditionary Force in France from the 27th February, 1915 until the 22nd Feburary 1917. Returning to home service as a ‘warehouseman’ in Southport and the Woolwich Dockyard with the ASC from the 23rd February 1917 until the 31st July that year. He was then appointed to a ‘Temporary Commission in the Leicestershire Regiment’ with the 1/2 Battalion on the 28th August 1917. He served as a 2nd Lieutenant attached to the 1/5 Battalion in France. 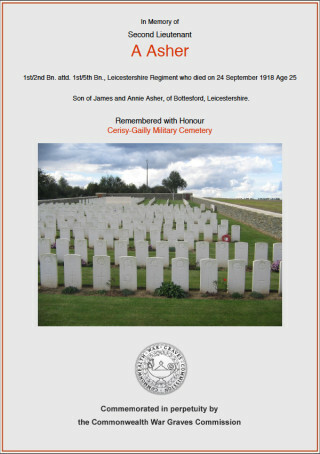 Albert Asher was killed in action on 24th September 1918 at Portruet, on the Somme in France. On that day two Bottesford families suffered the loss of their sons. 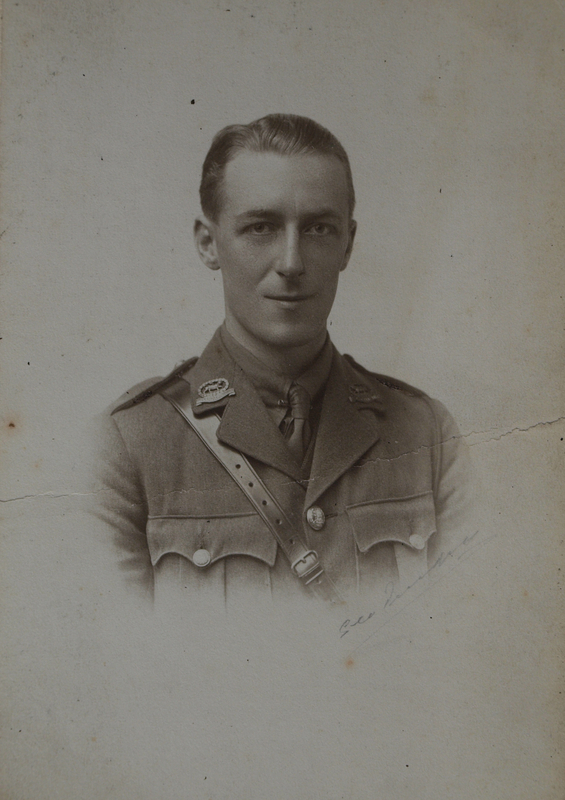 Fred Darby, who also served with 1/5 Battalion, as a Lance Serjeant, and was killed in the same action. Captain J.D. Hils in his history of ‘Fifth Leicestershires: A record of the 1/5th Battalion the Leicestershire Regiment, T.F., during the War, 1914-1919’ published in 1919 describes an advance on the village of Pontruet during the last hundred days of the war. He records the exact circumstances of Albert Asher’s loss. The Company’s heaviest losses were on the Southern or upper side of the village. For, in the S.W. corner, the Germans had two lengths of well defended trench, supported by a block house, and against these 2nd. Lieuts. Aster (sic) and Quint and Corporal Tyers led their men. The two officers were killed almost together at the second trench, but the Corporal broke clean through, only to be shot through the head when almost outside the village. Seven others of this same gallant party were killed at this corner, and the remainder, unable to deal with the blockhouse, fought their way through to the main part of the Company. The rest of “B” Company and the left half Battalion fared badly. Forgan’s trench, supposed to be held by a few odd posts, was strongly manned from end to end. It was wired in front and lateral belts had been placed at frequent intervals across it. It would have been a stiff task for a Company to take it with a direct frontal attack; to “work up” it was impossible. None the less, “D” Company (Brooke) did their utmost. Led by their Company Commander in person, the Company left the trench at Zero and started to work along it. There was wire everywhere, and the going was very bad on top, so that many men of the rear platoons dropped back into the trench and made their way along it—a fatal mistake. On nearing the Bellenglise road this Company was met with a perfect hurricane of machine gun bullets from three guns in a nest near the road. Captain Brooke was hit but continued to lead his men, and, ably backed by Serjt. Darby, made a gallant attempt to rush the position. The men still in the trench could give no assistance, and though two prisoners were taken the rush failed, and the German machine guns remained unharmed. Captain Brooke was twice hit again and with 2nd Lieuts. Sloper and Buckley, who were both wounded, had to leave the fight. Serjt. Darby and L/Cpl. Smith had been killed close to the enemy’s guns, Serjeant Sullivan was wounded, and for the moment the Company was leaderless. Lieut. Corah came up to take command, but by the time he reached the head of the Company it was too late to act, and Forgan’s trench remained full of the enemy. We had lost one Company Commander and three subalterns killed, one Company Commander and six subalterns wounded. Of the rank and file, thirty were killed, of whom three were Serjeants, one hundred were wounded, and eight were missing. But we had proved that five platoons could clear a village held by three Battalions (so said one of the prisoners) of the enemy. Albert Asher’s will left his effects to the value of £154 0s 11d to his mother, Mrs. Annie Asher. Albert Asher was initially buried in Pontruet. He now lies, as he fell, alongside his fellow officer, Henry John Quint, in the Commonwealth War Graves Cemetery at Cerisy-Gaily some 50 kilometres to the east of Pontruet. Remembered on the Bottesford Methodist Chapel Roll of Honour and Bottesford War Memorial, St Mary's Church. 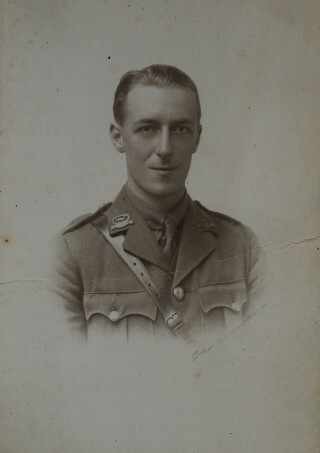 Frederick Darby, a close neighbour of Albert Asher, was also killed in the same action (please see above for further details). We are most grateful to Mrs. Ann Roughan and Mrs W. Bass for facilitating and granting access to Asher family photographs and documents.